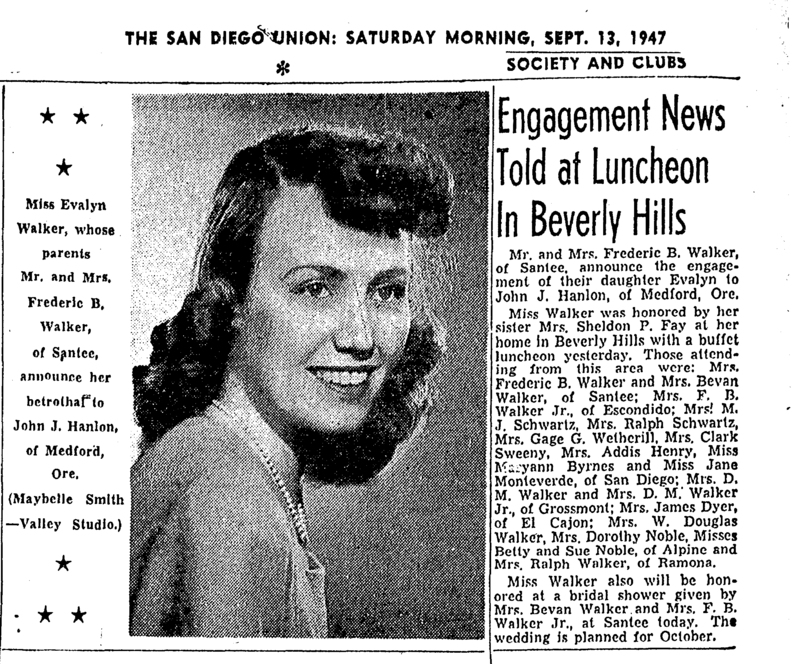 Mr and Mrs Frederic B Walker, of Santee, announce the engagement of their daughter Evalyn to John J Hanlon, of Medford, Ore.
Miss Walker was honored by her sister Mrs Sheldon P Fay at her home in Beverly Hills with a buffet luncheon yesterday. Those attending from this area were: Mrs. Frederic B Walker and Mrs Bevan Walker, of Santee; Mrs. F.B. Walker, Jr., of Escondido; Mrs M. J. Schwartz, Mrs. Ralph Schwartz, Mrs. Gage G Wetherill, Mrs. Clark Sweeny, Mrs Addis Henry, Mrs Maryann Byrnes and Miss Jane Monteverde, or San Diego; Mrs D M Walker and Mrs D M Walker, Jr of Grossmont; Mrs James Dyer, or El Cajon; Mrs W Douglas Walker, Mrs Dorothy Noble, Misses Betty and Sue Noble of Alpine; and Mrs Ralph Walker, of Ramona. Miss Walker also will be honored at a bridal shower given by Mrs Bevan Walker and Mrs FB Walker, Jr at Santee today. The wedding is planned for October.